Judging from the literature , there is a strong correlation between a subject’s persistence on dog being cat and his/her authoritarian inclinations. When (as a student) I first read about the test, I thought: “How much should one despise the humankind to invent such a test?”. Unfortunately, in my later life I met a lot of people who would reach number 13 with flying colours. E. Frenkel-Brunswick, Intolerance of ambiguity as an emotional and perceptual personality variable, Journal of Personality, 18 (1949), 108-143. I. Krasno, Authoritarian and egalitarian personality syndromes and intolerance of perceptual ambiguity. Unpublished doctor s dissertation, Univer. of Pennsylvania, 1952.
 Review of: Emotional Flexibility-Rigidity as a Comprehensive Dimension of Mind by Sigvard Rubenowitz. O. J. Harvey, The American Journal of Sociology, Vol. 71, No. 5. (Mar., 1966), pp. 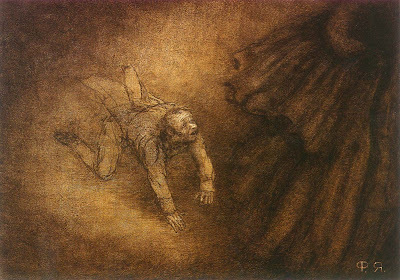 590-591. Stable URL. Nabokov: I often think there should exist a special typographical sign for a smile – some sort of concave mark, a supine round bracket, which I would now like to trace in reply to your question. I cannot understand why Mr. Wilson is puzzled by “dit” (Five: VIII: 13) which I chose instead of “ditty” to parallel “kit” instead of “kitty” in the next line, and which will now, I hope, enter or re-enter the language. Possibly, the masculine rhyme I needed here may have led me a little astray from the servile path of literalism (Pushkin has simply pesnya–“song”). Людская молвь и конский топ — выражение сказочное (Бова Королевич). «Как приятно будет читать роп вм. ропот, топ вм. топот» и проч. На сие замечу моему критику, что роп, топ и проч. употребляются простолюдимами во многих русских губерниях — NB мне случалось также слышать стукот вместо стук. 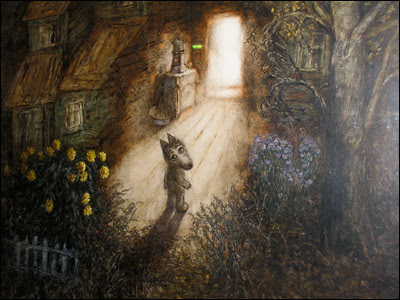 The character of Little Wolfy was created by Yarbusova. This is an overflow blog for more trivial or personal posts not suitable for my principal blog, Mathematics under the Microscope. I doubt that I will write here regularly. The title, of course, is borrowed from my favorite book.